The Ford Ranger was introduced here in 2000. It was the second mainstream volume model to be manufactured and sold by Ford Philippines. Although it shared its name with its US counterpart, the two generations of the Asian-market Rangers offered here from 2000 to 2011 were based on the Mazda B-series just like the earlier Ford Courier models. The first real all-new Ranger since the nameplate’s local debut landed on our shores in 2012, unlike its Mazda-developed predecessors, the new generation Ranger was developed by Ford Australia. The Ford Ranger was bigger and safer as well; it earned a five star Euro NCAP safety rating. It also came with a choice of powerful Duratorq TDCi engines. The Ranger could now wade through 800 mm of water. The fully revamped pickup helped boost the blue oval’s sales in the Philippines as well as other markets in the Asia-Pacific region. In 2015, the popular Ranger received its first major refresh. It received a completely redesigned front end that featured a hexagonal grille flanked by sleeker headlights. Inside, it received an all-new more upmarket dashboard. 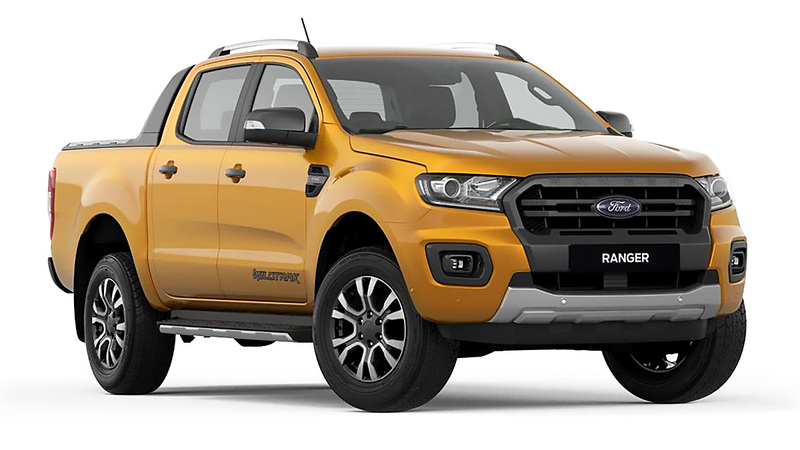 For the 2019 model year, Ford gave it a revised grille which featured a twin-bar pattern similar to the new US-market Ranger; the bumpers were again restyled to give it a cleaner more rugged look. Like before, the higher-end variants get a dual TFT instrument cluster, and SYNC 3 with an eight-inch touch screen. The top 4x4 Wildtrak's old 197hp 3.2-liter inline-5 has now been replaced by the 2.0-liter Bi-turbo inline-4 which also powers the Ranger Raptor. This means it produces the same 210hp and 500Nm of torque. Lesser 4x2 Wildtrak models get a single-turbo 2.0-liter mill which makes 178hp and 420Nm of torque. All 2.0liter variants get the new 10-speed automatic; the 4x2 Wildtrak has the option of a 6-speed manual. The XLT and XLS variants soldier on with the familiar 158hp Duratorq oil-burner and retain the old 6-speed automatic and 6-speed manual transmissions. 2018 also marks the arrival of the first ever Ford Ranger Raptor which was developed by Ford Performance. The concept was to apply the F150 Raptor’s winning formula to the smaller mid-size Ranger pickup, a size that is more appropriate for Asian and European markets. It’s easily recognizable as a Raptor, thanks to its wide stance, bulging fenders, reshaped front bumpers, a unique grille with F-O-R-D spelled out in big block letters and its black alloy wheels shod with rugged 33-inch diameter 285/70R17 BF Goodrich All-terrain T/A K02 tires. The Ranger Raptor features a reinforced chassis that allows the pickup to do high-speed off-road runs. It gets underbody protection as well as a 2.3mm think high-strength steel bash plate. Its long travel coil spring suspension systems consist of aluminum wishbones up front, and a live axle with a Watt’s link at the rear. All corners get Fox Racing Shox dampers with 46.6 mm pistons. Under the Ranger Raptor’s hood is the top 210hp 2.0-liter Bi-turbo diesel engine, power is sent to all four wheels through a ten speed automatic transmission.